The Latin American archaeology collection represents artifacts dating before the time of European contact from sites spanning from Mexico south to Honduras (Mesoamerica), the intermediate area (Costa Rica south to Colombia and Venezuela), and the Andes of South America. The Latin American ethnography collection features Andean folk art and every-day objects that document artistic traditions in Bolivia, Peru, Ecuador and Colombia. The term Precolumbian literally means “before Columbus,” referring to Latin American artifacts that date prior to European contact. Our Precolumbian collection spans three major areas: Mesoamerica, the Intermediate Area, and the Andes of South America. Ceramic sherds (fragments) in our archaeological collections are represented predominantly by materials excavated under controlled conditions from Mesoamerican sites in Veracruz and in the Maya area of Guatemala and Belize. We also have a surface collection from various sites in Honduras in the Intermediate Area, an important corridor for cultural exchange with cultures to the north and south. The Museum’s ceramic collection includes over 250 whole vessels, figurines, and effigy figurines from Latin America. 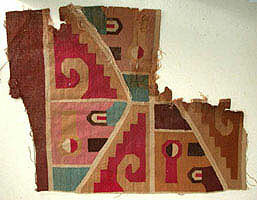 In addition, we have a small collection of wood and textile artworks from Peru. Most of the pieces considered to be artworks were accessioned before 1970. For artifacts donated after that date, we have required documentation that the pieces were imported prior to 1970, the year the UNESCO convention on the protection of cultural property was enacted. Our Maya artifacts generally date between A.D. 250 and 900, contemporary with the Classic Maya period, although we have some earlier and later materials. Collections include Classic Maya ceramics from the area of Copán in Honduras, the highland Quiché area in Guatemala, and neighboring lowlands in the Petén. Three culture areas are featured in the Latin American online exhibit: Mesoamerica, the Intermediate Area, and the Central Andes. Mesoamerica spans from Mexico south over the borders of El Salvador and Honduras. The Intermediate Area extends further south from Honduras and El Salvador to Colombia, Venezuela, and Ecuador. Directly to the south of Ecuador, Peru and highland Bolivia form the area known as the Central Andes. In the exhibit, Peru and Costa Rica are well represented, but there are also pieces representing many other countries in the three main areas. Graduate students selected and researched individual pieces, and their entries are marked with their initials, and a bibliography of citations appears in each section. The Florida Museum of Natural History greatly appreciates the contribution of Elizabeth Boyd, who took many of the photos and initiated this online project. Exhibit texts were edited by Susan Milbrath, Curator of Latin American Art and Archaeology, and Jeffrey Vadala served as our consultant for technical and design aspects, and completed the project’s web implementation. Cerros is a coastal Maya site situated on an arm of Chetumal Bay in Corozal District, Belize. The site was first excavated between 1974 and 1981 by Dr. David Freidel, then of Southern Methodist University. Excavators determined the site was initially occupied during the Late Preclassic era (300 BC – 150 AD) and most monumental construction dates to this era. Following a sporadic Classic occupation, the site was colonized by Terminal Classic refugees about 800 AD. It remained a fishing village into the Postclassic era. Several important discoveries stem from these excavations, including Str. 5C-2nd, which revealed impressive polychrome painted modeled facades since covered and replicated for visitors. A rich cache from Str. 6B revealed jade heads which may have once decorated a royal headband. Three Postclassic caches were discovered atop Str. 4A. One of these held over 75 artifacts including copper bells, gold alloy disks, textile remnants and spear points. Nearly all of the materials excavated by Freidel were exported to the United States and stored in Dallas, Texas from 1981 until 2009, at which time they were transferred to the Florida Museum of Natural History through an agreement with the Belizean government. The Cerros Research Online Collection (CROC) offers the first public viewing for most of these objects. It is provided thanks to a 2011 UF FEO Grant. Work continues to digitize the balance of the collection. Among our most important research collections is a group of well-documented ceramic and non-ceramic artifacts excavated by William Bullard in the 1960s in the Central Petén Lakes region of Guatemala. This collection includes chipped chert tools, spindle whorls, Postclassic effigy censer fragments, and an assemblage of Classic and Terminal Classic ceramic sherds from the sites of Ixlú, Topoxté, and the Macanché area. Learn more about the Bullard Collection. The museum collections include a small number of Zapotec ceramics from Oaxaca, Preclassic figurines (400 B.C. – A.D. 200) from the Valley of Mexico, and Classic period Remojadas figurines from Veracruz. 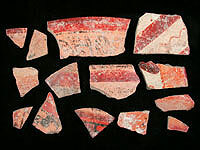 The state of Veracruz is also well represented by Preclassic sherds excavated at sites such as Trapiche, El Viejón, and Limoncito by James A. Ford in a collaborative project with Matthew Wallrath and Alfonso Medellín Zenil. These sherd collections represent an important resource for further study. The northern region of the Intermediate Area, also known as Lower Central America, is well represented by ceramic vessels from Panama, Costa Rica, Nicaragua, El Salvador, and Honduras. We also have sherd collections from a number of different sites in Panama and Honduras. The southern portion of the Intermediate area is represented by a small collection of whole vessels and figurines from Ecuador, Colombia, and Venezuela. A modest sherd collection, attributed to the Orinoco River Area, is the only material from the Tropical lowlands of South America in our archaeological collections. Our Museum has a relatively large collection from the Andean areas of Peru and Bolivia (the southern Andes, however, are scarcely represented). Our artifacts from Peru span a long period of time from around 200 B.C. to A.D. 1550. Only a few Late Horizon Inka artifacts are found in the Museum’s collection, but the previous period is well represented by ceramic pieces from Chancay on the central Coast of Peru, dated to the Late Intermediate period (A.D. 900-1400). 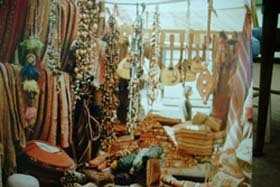 Textiles, and a weaver’s basket with spindles, spindle whorls, and spun wool from the Central Coast are also attributed to this same period. The Late Intermediate period on the North Coast is represented by modeled blackware ceramics from the Lambayeque (Sicán) and Chimu cultures. Artifacts from Tiwanaku in Bolivia and the southern area of Peru, dating to the Middle Horizon (A.D. 500-1100), include fine textiles and kero vessels used for drinking chicha (a fermented beverage). Provincial variants of this are seen in artifacts in the collections from coastal Peru. Our polychrome ceramics from the Nasca culture on the South Coast of Peru include both Nasca-Wari pieces and earlier ceramics showing changes in style between 100 B.C. – A.D. 600 (Early Intermediate Period). 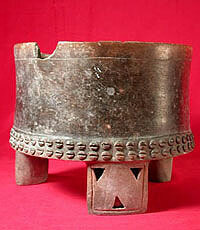 Our Early Intermediate period collections from the North Coast are limited to a few examples of Moche redware ceramics. Our Latin American ethnography collection includes over 300 works by indigenous peoples of Central and South America. The core of this collection was assembled by Roy C. Craven Jr. and Robert P. Ebersole in the 1970s for an exhibition at the University Gallery called “Folk Arts and Crafts of the Andes.” This temporary exhibit, sponsored by the University Gallery and the Center for Latin American Studies, featured 247 works of folk art and crafts from Colombia, Ecuador, Peru, and Bolivia, as well as a number of Roy Craven’s photographs of artists, workshops, and indigenous markets. Two of the photos featured on this page include art works represented in our collection. These pieces were all documented in a catalogue published in 1978 (University Gallery Bulletin II, No. 1). The catalogue includes detailed entries for each object, as well as more general descriptions of the various folk art categories in the exhibition. 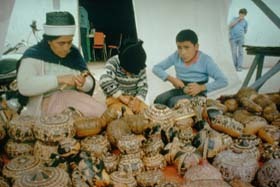 These include sets of objects related by form and those related by medium, with the basic groupings as follows: hats, ceramics, wood products, ceremonial folk art, textiles, metal products, musical instruments, and baskets and vegetable fibers. The collection is well documented in terms of specific provenience and date of manufacture. Most pieces were made in the mid 1970s, but few pieces are earlier, including a dance mask from Ecuador dating to 1950. This core collection of 539 ethnographic artifacts and 120 photos was accessioned in 2004 after being transferred to our museum from the Harn Museum Art (University of Florida). Although not often used in exhibitions, sherd collections are an excellent resource for archaeological research. The Bullard archaeological collection has been thoroughly documented by Prudence Rice in her book, Macanché Island, El Petén: Excavations, Pottery and Artifacts (University of Florida Press 1987), and in publications by William Bullard, whose field notes are housed with the collection. In addition, unprovenienced ceramic vessels, have served as a research resource in books such as Birds and Beasts of Ancient Latin America, an important study of Precolumbian animal imagery by Elizabeth Benson (University of Florida Press 1997). This publication accompanied an exhibition by the same title that toured nationally to California, Pennsylvania, and Florida between 1995 and 1998. The exhibition included Florida Natural History Museum pieces from the highlands of Bolivia and Peru, and the coastal regions of Peru, as well as artworks from the Harn Museum of Art, another important Precolumbian collection at the University of Florida.